Using knowledge management and spatial technologies, CeRDI, in collaboration with the Victorian Country Fire Authority, has developed the Victorian Fire Risk Register - Bushfire, a web-based service which maps assets at risk from bushfires. The register is used to support the development of Municipal Fire Management Plans. Online services were launched in 2015 to assist stakeholders to view and assess the risk of bushfires to assets across Victoria. 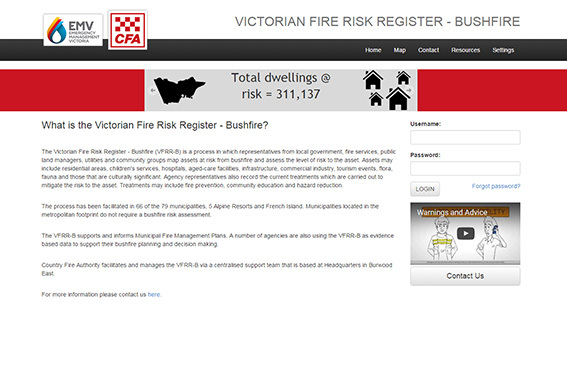 The Victorian Fire Risk Register-Bushfire (VFRR-B) was commissioned and undertaken in close consultation with the project funding body, the Victorian Country Fire Authority. The key objectives of the VFRR-B were to identify assets at risk of bushfires, to facilitate improvements in bushfire management planning through the availability of evidence-based data, and to enable risk assessment of public assets. The assets identified in the register include a range of human settlement, cultural heritage, economic and environmental assets that are both public and privately owned. The VFRR-B online services were developed following consultation with key stakeholders and in consideration of the step-by-step processes to facilitate access to primary and secondary (supplementary) information. The VFRR-B is available for access by Municipal Fire Management Planning Committees. Organisations represented on this committee have responsibility for identifying areas of risk from bushfire and to assess that level of risk for each asset. The Victorian Fire Risk Register - Bushfire (VFRR-B) is utilised in 66 of the 79 Victorian municipalities, 5 Alpine Resorts and French Island. The VFRR-B is being used to provide information for Municipal Fire Management Plans. A number of Victorian agencies use the VFRR-B as evidence based data to support bushfire planning and decision making. A range of advanced technologies were incorporated to ensure a robust platform for the efficient distribution of content and data. Concurrently, a user-friendly and intuitive interface has been prepared to ensure stakeholders can quickly access the required data. Data custodians can also provide updates to the asset information and key data which is then uploaded on the register at regular intervals, thus ensuring the currency of information. In addition, the register offers web-GIS capabilities, thus enabling users to access maps with customised layers for the integration of datasets. This provides enhanced interaction for users via the mapping of data specific to their region. The VFRR-B was commissioned and undertaken in close consultation with the project funding body, the Victorian Country Fire Authority. The Country Fire Authority facilitates and manages the VFRR-B via a centralised support team based at Headquarters in Burwood East.